We are seeking a person who is able to maintain school buildings as well as keeping the grounds in top condition. This will ensure full and productive use of district facilities. Must be physically able to perform all necessary duties, as well as be punctual with regular attendance. High School diploma, G.E.D, Job Training and/or experience (minimum of 5 years) in plumbing, electrical, carpentry, heating/cooling, ground keeping and vehicle maintenance) required. Will report to the Superintendent. 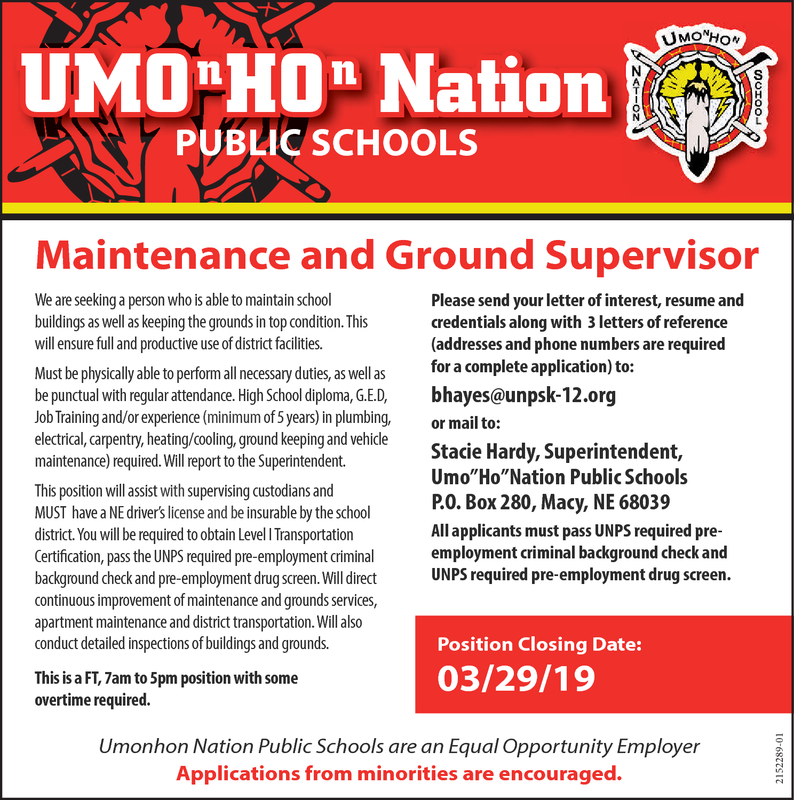 This position will assist with supervising custodians and Must have a NE driver's license and be insurable by the school district. You will be required to obtain Level I Transportation Certification, pass the UNPS required pre-employment criminal background check and pre-employment drug screen. Will direct continuous improvement of maintenance and grounds services, apartment maintenance and district transportation. Will also conduct detailed inspections of buildings and grounds. This is a FT, 7am to 5pm position with some overtime required. All applicants must pass UNPS required pre- employment criminal background check and UNPS required pre-employment drug screen. Applications from minorities are encouraged.